#SWFL Rep. Rodrigues: His bill says that if you make an impermeable layer permeable, you will be regulated. No pressure threshold. #SWFL When state House ended early last session, his fracking/oil industry bill was one of the victims, Rep. Rodrigues said. #SWFL Rep. Rodrigues: If we do anything w/o having the scientific study done, then we are not using allfacts. Study must be peer reviewed. #SWFL Rep. Rodrigues: Doubled the penalty for "bad actors" to $25,000 per day; currently $10,000 per day. #SWFL Rep. Rodrigues: His bill eliminates oil industry from being permitted for conventional drilling then switching to fracking. #SWFL There is no vote today," says Mayor Batos to audience here to listen to Rep. Ray Rodrigues talk about his fracking bill. #SWFL Today, Estero hears from Rep. Ray Rodrigues. He's going to talk abt his bill to regulate fracking in FL. Live updates to follow. #SWFL We've adjourned. Thanks for following! #SWFL Mayor Batos: The NDN editorial said we have kept the promises we have made. #SWFL Village Attorney Burt Saunders: You don't have to allow public comment right now, btw. #SWFL We've just taken a tangent. Councilor Wilson is talking about ECCL & how it is an idea clearinghouse outside of Sunshine Law. #SWFL Vice Mayor Levitan, Councilor Brown and Mayor Batos all say the email went out Nov. 4. #SWFL This kind of government doesn't lend itself to remove things without the rest of us, said Councilor Errington. 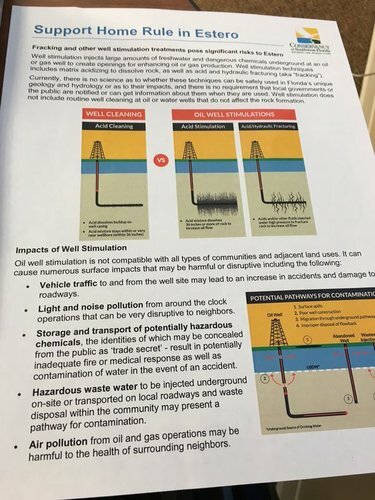 #SWFL Councilor Errington: I want to get to the original question -- how did the fracking issue get removed? It's supposed to be in writing. #SWFL Councilor Ribble: I'm not going to be here Nov. 23, I thought we were off -- I'm going to be in AZ with my grandkids. #SWFL Councilor Errington: We could have had the 1st reading, listened to him speak and then had the 2nd reading. #SWFL Mayor Batos: I don't think any of us should have made up our minds (on fracking) before we have all the information. #SWFL Mayor Batos: Decision to vote on fracking is fraught w/ hearing from people who will agree or disagree with you; need Rodrigues too. #SWFL Councilor Errington: Does he not work for us? & he shld have come to us & recognized the position that needed to be taken months ago. #SWFL Lee memorial's health center in south Lee should be open in the summer of 2018, per Vice Mayor Levitan. #SWFL Estero Councilor Katy Errington: We a place that's as central to the community as the Naples Pier. #SWFL Estero resident Bev McNellis reminds everyone that Estero's Christmas lighting ceremony is Dec. 5. I'll be there! #SWFL ECCL Director Eslick: Our monthly meetings have become a clearinghouse of ideas. #SWFL Estero Council of Community Leaders Director Eslick: His group is still trying to figure out where they fit in with the new village.